The RiLL AURORA 1500 pro series is the professional flagship model of the RiLL range. 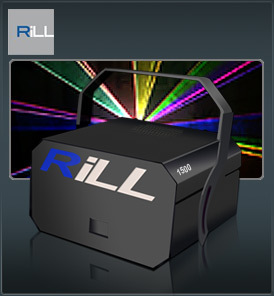 RiLL was the 1st laser company in the world to make a full colour laser system over 1000mw at an affordable price. Still today the RiLL Aurora 1500 pro is one of the most colour balanced white-light lasers in the world. The secret to our success with the RiLL Aurora 1500 pro is our in house developed red laser using the brightest frequency the eye sees a 635nm, and the choice of our blue and green lasers with undoubtedly the finest beam quality in the world. This means our lasers are made from the highest visible spectrum available making the Rill Aurora 1500 Pro up to 8 times brighter than comparable darker wave-length poor quality lasers, combine this with our superior beam quality, and the Rill Aurora 1500 Pro can easily take on many of the worlds 5-10 watt DPSS lasers and out perform.